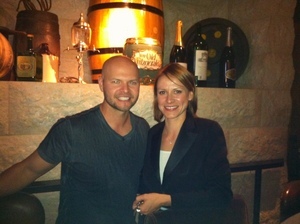 Cody Ross and wine director Petra Polakovicova at EPIC Roasthouse. 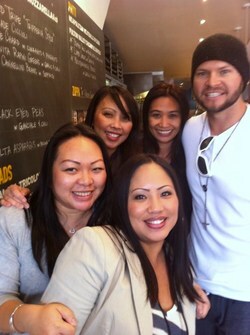 Giants’ left fielder and NLCS MVP ~Cody Ross~ came into EPIC Roasthouse’s Quiver Bar on Saturday the 13th—he enjoyed a dirty martini and split a burger with his buddy. Wine director Petra Polakovicova styled him out with a glass of EPIC cabernet sauvignon, and he signed the bottle, took a few photos with guests, and thanked everyone on the way out. Man after my own heart: ~Brian Wilson~ was spotted heading into Lucca Delicatessen on Chestnut St.